Sunday, April 11th, 2010, by Daniel and is filed under "Guest posts, Poetry ". You can leave a response here, or send a Trackback from your own site. 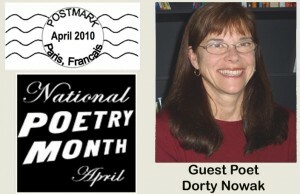 Dorty, I am looking forward to your next post about multicultural living on http://www.yourlifeisatrip.com/home/now-playing-in-paris.html where your work has appeared before. Any more experiences with Parisians in multiple languages you can tell us about? Light spins her wine-silk evening into shadows, spiraling through the mountains and across the clouds. Grass-stained quilts cover the sleepy eyes of shaded streets spreading over softly woven whispers where silence only was. Welcome her cloak of dreams and fairy tales! the peace we find in the night.